When it comes to legalizing marijuana, Canada isn’t sailing entirely into the unknown. A number of countries and U.S. states have experimented with loose pot policies (if not outright decriminalization), and these places offer potential models and lessons for Canada. 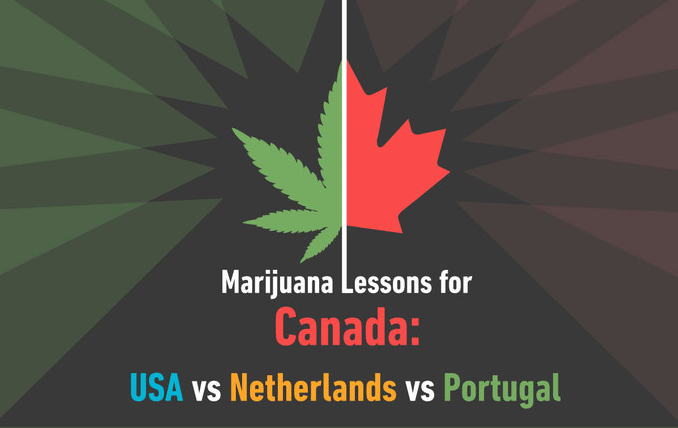 Toronto-based law firm O’Neill Moon Quedado LLP has put together an infographic comparing three countries known for their experimentation with drug decriminalization: The Netherlands, Portugal, and, most recently, the U.S. The law firm says we should be watching closely developments in the U.S., where Colorado, Oregon and Washington state have legalized marijuana for recreational use, with Alaska following this year. Those examples “will be the most relevant for Canada during the drafting of the law,” the law firm says. And it notes one other thing: For all the talk out there about decriminalization, it hasn’t happened yet. “You can still get charged for possession, growing or selling marijuana,” the law firm notes, adding that some activities surrounding marijuana will likely continue to be illegal after the Liberals’ reforms.